Come enjoy the classic italian dishes and intimate dining experience which earned tre dici the vote for best of westchester in 2017 & 2016! Italian cooking is in Giuseppe Fanelli’s blood. His family, which hails from the Italian region of Puglia, harvested herbs, vegetables and olive oil in their own grove. 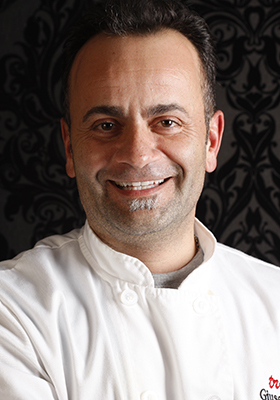 However, Fanelli’s passion for Italian cuisine goes beyond his family’s influence. He has worked at several of NYC’s most renowned Italian restaurants, from Felidia’s to Rao’s, gaining invaluable experience from the “best” in the industry. Fanelli utilizes his knowledge to create authentic, yet original dishes, and knows how to get the job done. Growing up, Fanelli did not see a cooking career in his future; but rather, he fell into the business when he was waiting tables and asked by the chef to fill in on the line for an injured cook. This was the first time he had ever cooked professionally, but he found his calling that night in the bustle of dinner service. So inspired, Fanelli decided to attend culinary school, and the rest is history. Fanelli headed up the kitchen at Baldoria, legendary Rao’s sister restaurant in Manhattan’s Theater District. At Baldoria, Fanelli perfected its Neapolitan home-style cuisine, special northern Italian delicacies, and classic southern Italian favorites, which brought in great reviews. Fanelli was Sous Chef at Felidia, celebrity chef/television host Lidia Matticchio Bastianich’s acclaimed Manhattan flagship. Fanelli had come to Felidia from F.illi Ponte, Tribeca’s Italian classic restaurant, where he was promoted from Chef de Cuisine to Executive Chef. Fanelli also gained incredible experience working at Union Pacific, which received a three-star review by The New York Times during his duration there. Serendipity brought Fanelli to tre dici in 2005, where he became the Executive Chef at the beloved Italian neighborhood restaurant in Chelsea. In 2008, he opened tre dici STEAK, an intimate steakhouse with a speakeasy, on the second floor. Unfortunately, unforeseen structural issues with its building suddenly closed the restaurants in the summer of 2015. Construction is already underway for a new and improved tre dici restaurant in its original location; however, as fate would have it, a space in Westchester became available. Fanelli is excited to start 2016 with a fresh start, bringing his elevated Italian fare to tredici NORTH. Fanelli has been featured on numerous popular television shows, including Travel Channel’s “Man Finds Food” with host Adam Richman; The Food Channel’s “Kitchen Casino,” and as the champion of Food Network’s culinary competition “Chopped."